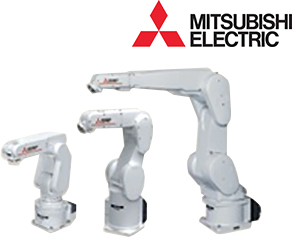 The Mitsubishi RV-FR-Series line of robots are ready to tackle all of your automation need. They offer an extensive selection of arm sizes, configurations, protection ratings, backed by “Next-Generation” features, and options designed to provide maximum productivity with minimal effort. Optimized arm length and 6 joints for a broader range of movement support complex assembly and process operations. Compact body and slender arms capable of covering a large work area and large load capacity. Suitable for a broad range of layouts, from transporting machine parts to assembling electrical components. Designed to withstand environmental conditions, making it ideal for a wide range of applications without having to worry about the installation environment.